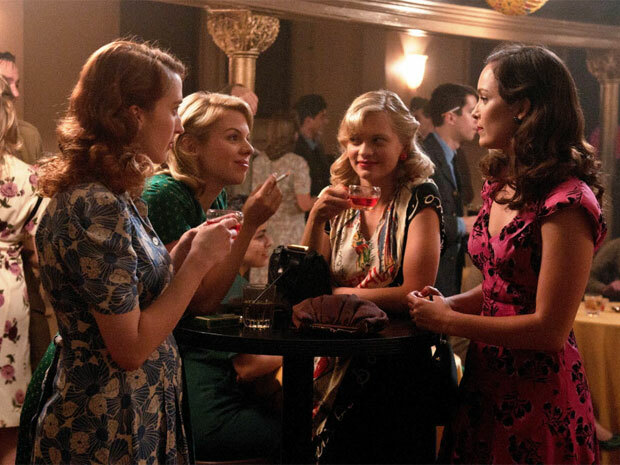 The latest period drama that you should be watching is Global's new mini-series Bomb Girls. Set during WWII (but before Pearl Harbor), the show chronicles the lives of the workers at Victory Munitions in Toronto, their struggle for equal treatment in the workplace and what it was like living during the war. I'll admit, I had some low expectations for the series. "Another Mad Men imitation attempt," was the first thing that popped into my head. Well, so far the first two episodes have surprised me - I hope that it can gain momentum and grow into a full-fledged series, maybe even with a second season. Bomb Girls is a Canadian show! There is very little programming filmed and produced in Canada, so to have a show like this in my country gives me hope to the entertainment industry. The show has also featured some Canadian music, including my favourite gal Alex Pangman as well as Canadian retro songstress Jill Barber. I also feel like there is a lot of diverse characters: the rich girl, the tormented runaway, the Saskatchawanian-lesbian, the super hot Italian - the actors and characters, for the most part, all have great chemistry. The story could go anywhere from here. I must admit, the acting in pretty forced in parts. When Gladys tells James that she wants to be a bomb girl, it was almost painful to watch. Speaking of painful to watch, I am going to get a ulcer from this show. Maybe it's just because I am a giant baby but I sit there and freak out the whole time I'm watching it, waiting for somebody to blow up! 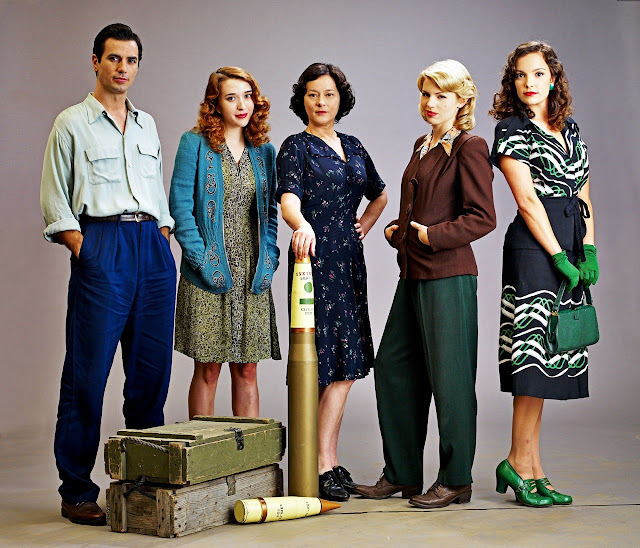 In short, I give Bomb Girls a 4/5, but there are still four episodes left before its finale. Who knows what will happen. Have you watched it yet (if not, visit their website - the episodes stream online starting from the day after its air date)? What are your thoughts? Hey! Just noticed you started following my blog and it's awesome to find another Albertan on the web. I can't say as we agree about Bomb Girls, but you certainly have some awesome taste :) That's 3 of us I know of now, perhaps an Alberta vintage blogger get together will be possible one day after all! Many things in this drama are not credible. One example: the relationship between Gladys and James. She has a heart, he is a cynical businessman. Why does she want to be with him? When he breaks up with her, she should be happy to be rid of him. Instead she begs him to take her back. She could do so much better. Another example: When Gladys meets the soldier Lewis Pine, he falls in love with her, even though they have only known each other for about five minutes. He asks her to marry him, and she says yes. This scene is totally absurd. A third example: Moretti and Lorna. First Lorna frames him as an enemy agent and he is fired. Later when he is cleared and returns to the job, he declares his love for her. Why would he want to be with someone who betrayed him? This development is not credible at all. There are other examples as well. This drama does not deserve four or five stars. I think a rating of two stars is proper.